Six years on, Columbia’s Omni Heat technology is found in more garments than ever. From boots to jackets, reflective Columbia linings help retain and reflect body heat to increase warmth in cold weather. We’re fans of Columbia’s Omni Heat snow boots, jackets and pants. While we haven’t tried their gloves or baselayers since 2011, we were not impressed with Omni Heat in those forms (since fingers in gloves are generally colder than fingers in mittens, it doesn’t make sense to try to reflect heat from isolated fingers; the baselayers went on cold and felt colder than wool. They were also stinkier). Columbia continues to offer solid products at relatively low prices. Their Interchange Line (sometimes called 3 in 1), is especially versatile for kids and adults. You can find Columbia online at WinterKids.com, WinterWomen.com and Amazon.com. New Year’s Day: We wake up and the temperature is -4 degrees Fahrenheit. And, the sun is up. This is no pre-dawn chill. The forecast for skiing is -25 degrees with the windchill. For one brief moment, I think to myself, “This would be a perfect day to field test my Columbia Omni-Heat jacket.” Then, coming to my senses and recognizing that I don’t have to go out when it is -25 degrees, I put on my gym clothes and wear the Omni-Heat to the gym for spin class. Actually, since I got my Omni-Heat jacket from Columbia in early December, I have field tested it quite a bit. In November, Columbia sent me an email asking if I would be willing to test a jacket from their new Omni-Heat line. My reaction was “Yahoo! Who wouldn’t want to field test a new ski coat?” The reaction of my sons? “No don’t do it! Have you seen their ads? They use naked people in their ads!” After I reassured them that under no circumstances would they have to suffer the indignity of seeing me cavort in the snow in a bikini before wrapping up in an Omni-Heat jacket, they were okay with it. For the next few weeks, I waited for my jacket as the photo-ops and field-test ops passed me by. We went to the Grand Canyon for Thanksgiving and the temps each morning were below zero. No jacket. We went to the Mens’ World Cup Downhill at Beaver Creek, Colorado and the wind was howling. No jacket. Of course, by mid-December, ever-fickle Mother Nature has switched gears and Colorado was now in the midst of unseasonably warm weather. My first outing with the Columbia coat was a snowy day skiing at Aspen. The high was probably 28 degrees Fahrenheit and in the morning it was snowing and the wind was blowing. By afternoon, the sun was out. I was warm all day. I was warm when the rest of the family was cold. Actually, at times, I was even too warm and the pit zips came in very handy. This was pretty much my experience each time I have skied in Omni-Heat. I have been warmer than I would have expected. Two times out, I actually ditched my fleece and just wore a wool baselayer top and the jacket. Outside of warm, sunny spring days, I can say with near certainty, that I have never done that before. For even if I am not cold, I am usually too afraid of being cold to shed a layer in late December. Interestingly, the one time I was cold in this jacket was when I was a spectator. My husband took up cyclocross this fall and the race series finale was on a bitterly cold, damp morning when a mix of snow and rain was falling. Standing still for an hour (well, actually, jumping up and down in place, ringing a cowbell and running out to give him water and then retrieve the thrown bottle — but essentially standing still), I was chilled. I don’t know if the Omni-Heat technology works best when one is raising their own body temperature, thus triggering the Omni-Heat technology, but as a spectator, I wish I’d worn more layers and had some hand warmers. Perhaps I overestimated the warming ability of the jacket or perhaps I didn’t dress appropriately. Aside from the “spectator test,” I indavertantly put the jacket through a couple of other tests. The first, the “mustard test” could have been a disaster, but was not. While skiing at Park City Mountain Resort, we went into the Mid-Mountain Lodge for lunch. It was a snowy day, but again I wasn’t cold. About 1/2 hour into lunch I look down at the carpet and see yellow mustard everywhere and an upside down plastic mustard cup. Hmmm. I think. Someone spilled their mustard. Then, as my eyes follow the mustard trail, I notice that there is mustard all over the front of my jacket, which is hanging on the back of my chair. I am bummed. How embarrassing to have to ski with a mustard stain all over me! Staying warm in Omni-Heat, pre-mustard, at Park City. My husband gets some damps towels from the busboys and amazingly, with almost no effort, we wipe the mustard off. Completely off. There is no lingering yellow stain or even a tinge of yellow. The mustard is simply gone. We are completely impressed. The busboys are impressed. People at the next table are impressed and we all rave about this great fabric. And while I hope you won’t try the mustard test on yourself, it made me realize that even on days when inches and inches of wet snow were falling, my coat never got wet or even damp. This fabric really repels moisture. The next inadvertant test was one I repeated twice while in Utah. It is the “ski with the pockets unzipped” test. This is how I lost my cell phone at Aspen Highlands a few years ago. I sat on the lift with an open pocket and the cell phone slipped away. Twice I have been on chairlifts this season, wearing my Columbia coat, and twice the left front pocket has been unzipped. So far, so good. I haven’t lost a phone, a camera or my glove liners. The pockets are not super deep, but they don’t allow things to just slide away. Columbia’s Omni-Heat Technology will keep you warm and dry, even when the weather is like this. So, in summary, here are my impressions of the Columbia Omni-Heat Black Diamond Dash jacket. It is warm, especially if you are ripping and moving. I love the fabric. The cut is flattering. At first, I found it a bit weird that the “liner” jacket is truly a separate jacket with its own zipper. While the sleeves and collar are attached to the outer jacket (and can be detached), the inner jacket doesn’t zip into the outer jacket. Once I got used to this, I actually like this and I think it probably makes the coat warmer. The jacket has all the features I would expect: powder skirt, pit zips, thumb hole cuffs, a sleeve pocket for RF lift tickets, an interior pocket. I wasn’t sure the coat had enough pockets when I first wore it. I like to stash lots of stuff in my coat: pb&j sandwich, hand warmers, camera, phone, etc. Then it dawned on me that I have more pockets in the inside coat. Now, I think there are plenty of pockets. The downsides of the jacket are that within just a few wearings, I managed to rip the loop and snap fastener that attaches the sleeves together. I didn’t really even pull very hard and it tore off. The zipper on the inner jacket tends to come unzipped from the bottom, but it is self-repairing if I just unzip and zip up again. And, while I think this Columbia jacket is much more fun and stylish than the ones I have had in the past, I think their entire line could be improved by amping up the color and pattern of the fabric. 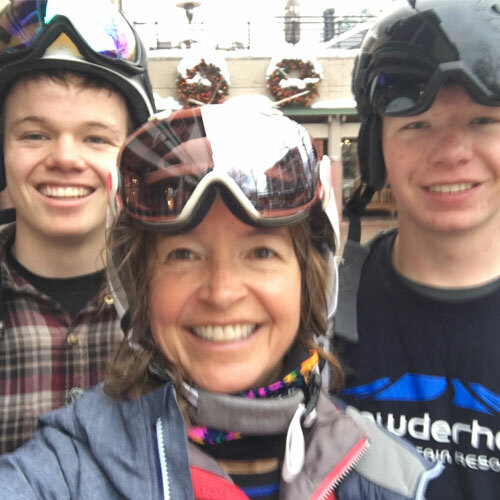 Not that I want to look super-trendy on the slopes, but let’s face it, most moms don’t want to look like “moms.” We want to look like the epic skiers, riders, tele’ers or whatever, that we are…at least in our own minds. © 2011 – 2017, braveskimom. All rights reserved. Any use or publication of content, including photos, requires express permission. Great and helpful review! I recently bought some Columbia base-layer stuff, and have been thrilled with it. Enjoy the rest of the season in your new jacket!